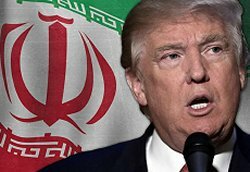 - Will Trump's Next Iran Sanctions Target China's Banks? - Don’t ‘tear up’ the Iran deal. Let it fail on its own. - Woman Investigating Clinton Foundation Child Trafficking KILLED! WASHINGTON, DC, June 9 /PRNewswire/ -- A recent public opinion survey of Iranians, conducted by The Tarrance Group, surprisingly found that a vast majority (74%) of Iranians feel America's presence in the Middle East will increase the probability of democracy in their own country. The survey, which was the first of its kind, found two-thirds of Iranians believe that regime change in Iraq has been a positive for both neighboring countries: with 66% believing that it served Iran's national interests, while 65% believed the Iraqi people will, in the long-run, be better off. Commissioned by the Iran Institute for Democracy, the survey discovered that a solid majority (65%) of Iranian adults consider fundamental change in Iran's system of government, especially its Constitution, a must to bring freedom and more opportunities to their homeland. Validating reports of widespread discontent with the clerical regime, three-fourths of Iranians (73%) support the call for a national referendum through which Iranians are given a chance to choose the form of government of their choice. Significantly, almost all Iranians reject their government's attempts to keep exiled Iranians out of the political and economic equation of Iran. Fully 84% of all Iranians say Iranians living abroad should have a role in shaping the political and economic future of their homeland. Regarding the forthcoming Presidential elections, in a troubling sign for the regime, nearly four of every five Iranians (79%) say that the upcoming elections should not be held unless they are free, fair and transparent. While more than 70% of Iranians feel the world is closely monitoring the June 17 election process, in a telling sign, 57% of the population would be inclined to support a boycott of the elections if conditions for a free, fair and transparent election are not met. Demonstrating disinterest in the pool of candidates, only 39% of adults were able to choose a candidate representing their viewpoint, with Hashemi Rafsanjani only leading (32%) among those who could identify with a candidate. Hence, Mr. Rafsanjani only enjoys 13% support among all Iranians, including those who could not identify an acceptable candidate. That said, when asked to make a prediction, 42% of all surveyed predicted Rafsanjani would be declared the winner of elections, indicating a perception of a predetermined conclusion. On the nuclear issue, a solid majority of surveyed respondents inside Iran (60%) feel that the international community's worry about the prospects of terrorists obtaining weapons of mass destruction is real. Further, a plurality (42%) says the Islamic Republic gaining access to nuclear weapons would add to their anxiety, discomfort and inability to sleep comfortably at night, while only 37% say it would not burden their peace of mind. Commissioned by the Iran Institute for Democracy, the survey was conducted among N=758 adults age 16+ (voting age) in Iran, from May 26 through June 4, 2005. Sample design, questionnaire design, and data processing were conducted by The Tarrance Group. Random digit dialing (RDD) was used to generate the sample, and interviews were conducted via telephone from a call center in the United States using Farsi-speaking interviewers. The margin of error associated with a sample of this size of +/- 3.6%, at the 95% confidence level. The average interview length was 24.6 minutes.